all of these are free to play and free to win, ge.ne.sis and ebf4 has some paid content but none of them are required to beat the game (and the game is still easily beatable without the paid content) so it's not really a big deal at all. mardek ch1-3: turn based, really nostalgic. fourth wall breaking, satirical nonsense that anyone would enjoy. not too difficult and there's a thorough walkthrough if you need it, full team customization, and about 60 hours per playthrough. you can choose when you want to do certain parts of the story, and a lot of side stuff is completely optional. also options to talk to your party members in the environment you're in, and you unlock backstories by leveling them up. highly recommend. pixelated overworld for the nostalgic feel and pretty fun combat. beautiful music made by the developer for the game fits each area perfectly. i mean just look at this screencap i.imgur.com/mOsRoaZ.png also, a lil fanart i.imgur.com/rofU2pb.png . I actually made a comic based on the events of Ch1 that I may compile and post here if it's requested. ge.ne.sis: a fantasy rpg from 2009, the art style is really cool and is gradient vectors, unlike a lot of stuff you see nowadays. story isn't bad, worldbuilding is beautiful, and the lead is a poor poc badass female!!! currently playing this through with xiphos and we are both lovin it like mcdonalds. music is whimsiful and enjoyable. detailed strategy guide and walkthrough is avaliable. maybe 10 hours play time? worth it. if you go digging and find the forum for this game i am active there (even though the forum is dead) and you can find my fanart too! and finally ebf, a casual and fun rpg series. lots of luls and pretty mild difficulty curve. maybe 30 hours play time (for the most recent addition which i most recommend, ch4). music, once again, is phenomenal and art style is very pleasing to the eye. fourth wall breaking, with turn based combat and great graphics. highly worth it, comes with detailed walkthrough for each map. i love mass effect. i love mass effect SO MUCH. it's my favourite game/game series of all time. i rlly like games where you can make choices and have different morals (im always the good guy anyway bc i'm weak tho) and talk to your companions and whatnot so mass effect, dragon age, infamous, walking dead, fallout, just most bioware games actually yknow ??? okay i just love love love space and fantasy games so mass effect totally is great and so is dragon age, also you can be super gay in both but somehow i ?? romanced ?? the grumpy lizard man ??? in mass effect instead ??? of the hot girl alien ??? 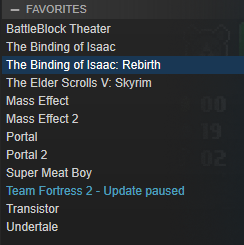 pc games,, the fave is the binding of isaac bc it's so fun despite being essentially the same every time !! there are so many variables and characters and items that's it's so unique and fun and i love it !!! Also just going to go ahead and sticky this. Mario Kart, anyone? 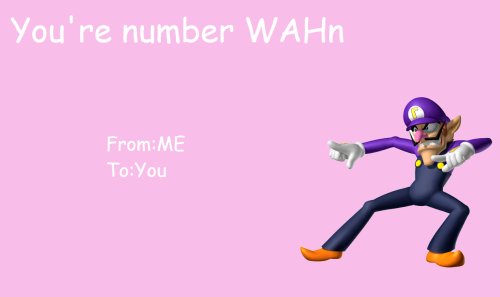 I will never stop playing as Waluigi. Sorelia wrote: Mario Kart, anyone? I will never stop playing as Waluigi. Guuyyss I got me some steam credit.... I need vidya game suggestions!!! Quillan wrote: Guuyyss I got me some steam credit.... I need vidya game suggestions!!! YES! Dude- NO one I know plays it. I was so sad when Luke died 'cause I shipped him and Jane. aye my bros !! sadly for my wallet, the steam sale is on !! any good games on sale? I need more game suggestions guys x,x I am trying to channel my feelings and beating games really makes me feel better. Rip I only have like 15 dollars tho so keep it in my price range? I have been looking at Undertale but I don't really know if it is for me? Perhaps someone could describe the game play? 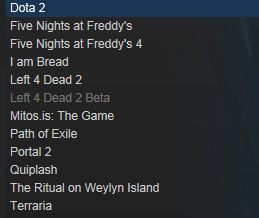 Edit: nvm i bought undertale and gmod...time to have no life again. also i realize that when u search up my user u cant find me...so when u are trying to add me on steam search "Quillan" and I am the one with the pic of a girl and the background is pink and she has like markings on her face. i love mass effect. i love mass effect SO MUCH. something thats a throwback to the Unreal Engine of the 1990's is the older version of Unreal Tournament. The newer versions are good too but nothin like pvp on older stuff. When I was younger I'd go w dad to his job I would sit in the back and one of his classmates would stay after to pvp with dad & i xD. Location : In a tiny spaceship, far from here. Which is good. take me away from depression.